The OpenStage WL3 telephones are an advance variant of telephones for mobile workplaces that use WLAN technology for transmission. These telephones can be deployed in environments with the appropriate SIP platforms and use WLAN infrastructure which supports the dominant infrastructure standards IEEE 802.11a/b/g/n. In addition to the predecessor product the OpenStage WL3 supports now supports not only wireless telephony, but also messaging and alarming as options. Communication with the platforms is enabled through SIP. The following information provides an first overview. This list is not exhaustive. Please refer to the detailed operating instructions for more information. at the top of the product offering stands the OpenStage WL3 Plus, it offers not only VoWLAN telephony, but also messaging and personal alarm functionality. SIP Feature set with different platforms, see this link. 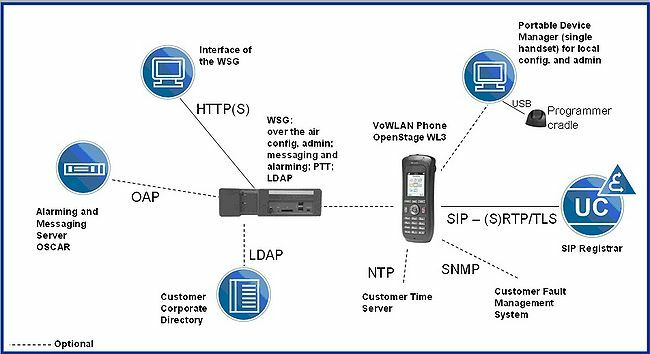 The PDM is an optional management tool for OpenStage WL3 telephones. It is a software application that runs on a local Windows PC. It has a Java-based Graphical User Interface (GUI) and a database containing parameters specific for each of the OpenStage WL3 telephones used in the system. Examples of parameters are WLAN system parameters and VoIP service parameters. The PDM also enables firmware upgrades. Before an OpenStage WL3 telephone is able to access the WLAN and any services, it must be configured with WLAN system specific parameters, for example the SSID (network identification). The parameters are synchronized with the OpenStage WL3 telephones via a USB cable connected to the OpenStage WL3 Desktop Programmer. The PDM Software itself is free of charge and is via the usual Siemens Enterprise Software supply services available (e.g. via SEBA), please look for OpenStage WL3. The Wireless Service Gateway (WSG) is an optional web-based appliance used for device management, messaging and alarm handling. The OpenStage WL3 telephones needs a basic parameter setup with the PDM, which are basic WLAN and IP settings, to be able to communicate with the WSG. Thereafter the WSG can be used to remotely and wirelessly edit parameters and update software of the OpenStage WL3 telephones. It saves the parameters and software for all OpenStage WL3 telephones in a database with the maximum capacity of this data base being 2.500 OpenStage WL3 telephones. The WSG is also required if LDAP access from the OpenStage WL3 telephones and interfaces to the alarming/messaging Server OSCAR are required. The OpenStage WL3 telephones must log on to the WSG to enable the messaging and alarm functions. Each OpenStage WL3 has also an own configuration menu. This menu can be used as simple option for single handset configuration. The interface for the solution in the platforms is SIP. One SIP user is required in the platform for each OpenStage WL3 telephone; please remember the necessary SIP user licenses in the platforms mentioned above. For enabling messaging and alarming the OpenScape Alarm Response Professional (OSCAR), from V3 is required. The OSCAR needs an Open Access Protocol License (OAP) for the connection to the solution. The SIP firmware provides encryption capabilities. Hence its distribution must follow legal requirements which do not allow unrestricted SW distribution via the Internet. The firmware is only provided by Siemens technicians or by official Siemens Partners. Customers with self-care contracts will have access to SW within the Partner Portal Web portal (login required). using WinPDM and USB craddle . The current application software of OpenStage WL3 / WL3 Plus is OpenStage WL3 V1 R0.1.0 (3.5.12). The current application software of WSG (Wireless Service Gateway) is OpenStage WL3 Wireless Service Gateway V1 R0.2.0 (3.52-A). The current application software of WinPDM Tool is OpenStage WL3 WinPDM V1 R0.0.0 (3.9.4).